Contrary to what Mr. Grove writes, showcasing yourself in a prom dress doesn’t paint you in a good light to college admissions counselors. Oy vey. 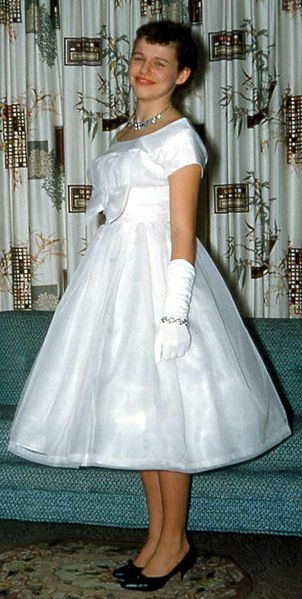 This particular young woman went to prom in the 50’s, according to the Internet. Allen Grove, writer of the “About.com” blog on college admissions recently posted about fifteen Facebook photos that will make you look good to admissions officers. While we typically enjoy his posts, we happen to think that this post is utterly ridiculous. Citing a 2010 Kaplan survey in which it was found that 82% of college admissions counselors use Facebook to recruit students, Grove goes on to describe the kinds of Facebook photos that can hurt and help your chances for admission to the colleges of your choice. Don’t get us wrong — we’re lifelong students of social psychology — a first impression is an important one. This information primes someone with what they’re going to think about a person and how they’re going to evaluate them. And since some college admissions counselors do indeed look up applicants on Facebook, it is important that you don’t have a scandalizing photo. You don’t want a photo drinking beer (that would be illegal anyway for students in the United States under the age of 21 applying to college). You don’t want a photo displaying gang signs. That can certainly hurt your chances for admission should a college admissions counselor see these photos. But Mr. Grove goes off the deep end big time when he writes that students should select a photo in which they’re posing with an award. That would be arrogant — and who likes arrogant people? Or a photo where you’re “the star of the team.” That’s narcissistic. Or “the world traveler.” In fact, Mr. Grove writes, “Part of being a well-rounded student is having a worldview that reaches farther [sic] than your hometown. If you’ve traveled across the U.S. or visited other countries, put some of those travel pictures in your Facebook profile. Read the mission statements of colleges, and you’ll often see an emphasis on global awareness.” Oy vey. And well rounded? Not exactly the phrase college admissions counselors are targeting. Contrary to what Mr. Grove writes, don’t emphasize how much you travel as you apply to college. That just means you can afford to travel — something college admissions counselors might be rather jealous of. The silly photos that Mr. Grove suggests you showcase to admissions counselors don’t end there. He even suggests that a “prom goer” photo would paint you in a good light to college admissions counselors. Really? That’s just not the case. Just about every high schooler goes to prom. How does this paint you in a good light to an admissions counselor? The thinking here is: Just. Plain. Wrong. While you’re here, check out this post on Facebook and College Admissions.